Something in the vague, somewhat dimmed sound of constantly beating drums manages to set in the right kind of atmosphere just seconds before the entrance of the rest of the music on the first song in this album. 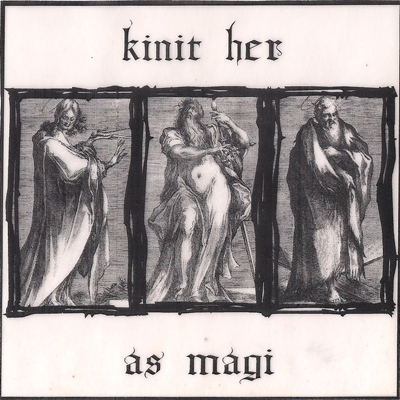 Within mere few seconds, we are taken by N.Ritter, T.Schafer and V Wachowiak, together forming Kinit Her, deep inside what sounds like a cavernous space where they are going to perform their coming splendid ceremony. To new ears, Kinit Her are introduced through this album as enigmatic bearers emotional, resonant music, uplifting a matching, disturbing vocals. At times I think about the reasons why these songs sound so mystical, eerie, and at the same time – charming and uplifting. The magical words, sung by the wooden throats aging mannequins are chilling to unsuspecting ears, and are probably the most remarkable and memorable element in this band. These high pitched, toy like, voices are far from being the single outstanding element in the album, casting shadows over the rest of the music. Balanced with the haunted/angelic singing is the mesmerizing music, beating endlessly with spiritual zealously. “Blood swords” opens with an intense emotional guitar playing and electronic sounds. On the next song – “Telekinetic Calendar”, Kinit Her perfects their alchemical blend of the eerie and melancholic with the uplifting and delightful. It’s hard to pick a favorite song from this E.P, but if I had to do this, then it would be “The Pillars Seed”, where at some points you can mistake the guitar to an old harpsichord. It is this song where the energies of the band members reach the highest peak, totally immersing the listeners in their dedication for their supernatural music. As a whole, “As Magi” is a wonderful album that can charm you immediately. I suggest you yield to it as soon as possible.